RAWALPINDI, Dec 18 (APP):Chief of Army Staff (COAS), General Qamar Javed Bajwa, during his visit to Qatar, attended the National Day Parade of Qatar. 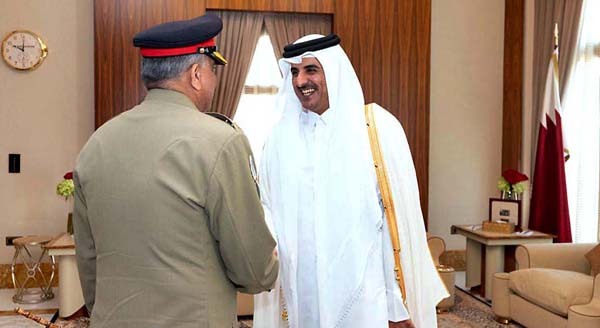 He congratulated Chief of Staff of Qatar Armed Forces, Lieutenant General Staff (Pilot) Ghanim Bin Shaheen Al Ghanim on a professional and impressive parade befitting Qatar’s national solidarity and progress, an Inter Services Public Relations press release Tuesday said. Earlier, the COAS called on Emir of the State of Qatar, Sheikh Tamim Bin Hamad Al-Thani. The COAS thanked the Emir of Qatar for his country’s continued support towards a negotiated political settlement for peace in Afghanistan. Both also discussed measures to enhance bilateral security cooperation. The COAS also called on Prime Minister and Minister of Interior of the State of Qatar, Sheikh Abdullah Bin Naseer Bin Khalifa Al-Thani. The Qatari Prime Minister expressed keen desire to further diversify and broaden mutual cooperation including security. The COAS assured him of Pakistan’s full cooperation in all mutual undertakings.